Not a very long tips & tricks post this time, as I want to talk about a very specific subject. It’s still a very important aspect of your track though. Too much of it, and your track sounds boomy, pushing away additional instruments. Too little of it, and your track will sound powerless. You probably guessed it by now; do you have a moment to talk about our lord and savior of tracks, the sub bass? I often get asked how to process the sub bass. How to get that clean, controlled and well-defined sound. People often experiment a lot, but simply don’t get that sound that’s both crystal clear yet still pushes the track forward like you hear in professional tracks. And the truth is that it’s actually really simple. With sub-bass the golden rule ‘less is more’ counts more than ever. Reason for this is because in the lower frequencies it becomes increasingly difficult for our ears to hear the pitch of a sound, the tonal information. In fact, it our ears aren’t particularly sensitive to the low frequency content at all. (Again; the Fletcher Munson Curve – Perceived Loudness) Because of that, if you have a sub with more harmonic content in the sub region (or distortion due to limiting/compression), and not a distinct fundamental frequency, it becomes even harder for our ears to focus. Resulting in a less defined and controlled sub bass. The cleanest and easiest to control sub bass is still a pure sine wave. If you make room for it by EQ’ing your other instruments, you should be good most of the times. No compression needed at all. In fact, compression on a pure sine wave can give you distortion in places you don’t want distortion. Of course you can still give it more presence or character by consciously saturating / distorting the sound. Just make sure the extra frequency content generated by the saturation/distortion goes into the higher frequency regions. (Low-mids and up) and doesn’t add any unwanted harmonic content in the sub region itself. This trick is often used to give your bass more presence, and make it’s pitch more apparent, also on smaller speakers / systems that can’t reproduce a proper sub bass signal. That way you’ll keep a clean sub, but you can still have the low-mids and up layer sound raw and punchy (or simply just accentuate the pitch of the sound) if wanted. It’s a win-win really. 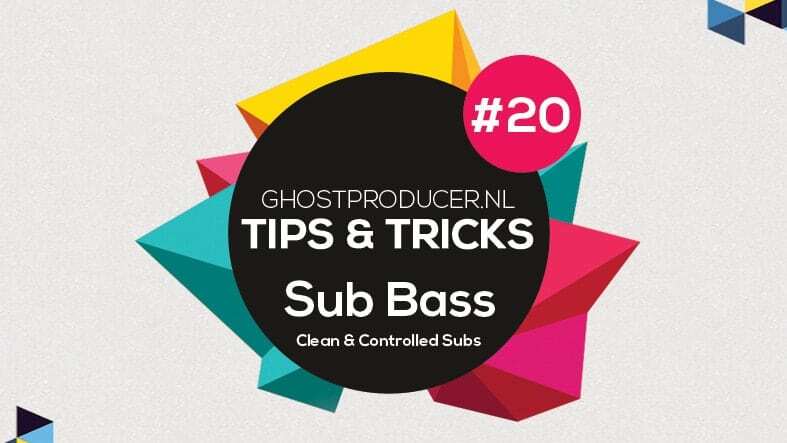 So to sum things up; if you want a clean sub bass, keep things clean in the sub range! A distinct fundamental frequency for the sub, not too much other harmonic content in the sub range. And saturation / distortion that only adds in the low-mids or above, but not in the sub range itself. That’s pretty much all there is to it.